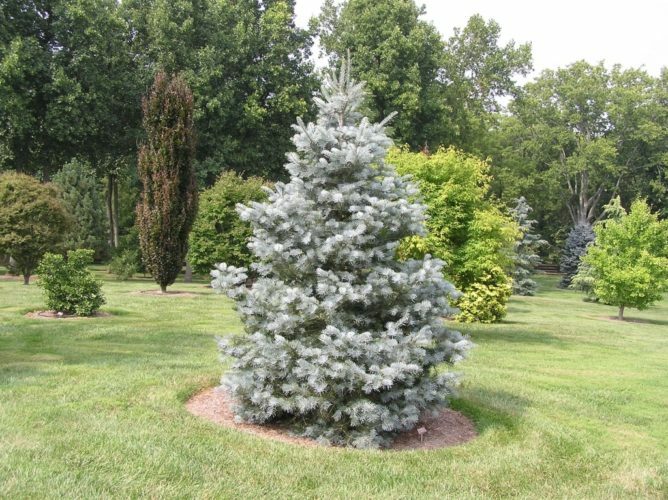 Abies concolor 'Candicans' is a large growing selection of White fir that is considered by many to be the Bluest of all conifers. 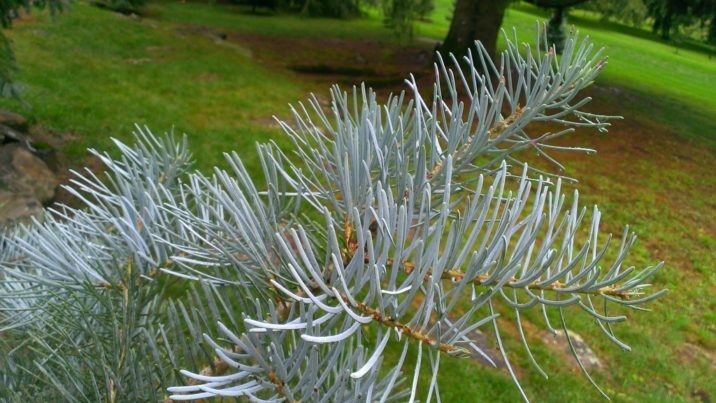 Long bright-Blue needles grow to lengths of 2 inches (5 cm) or more; bark is smooth and silver grey in color. Young plants grow with a somewhat open habit and may require staking to induce the development of a terminal leader. A mature specimen will easily measure 10 feet (3 m) tall and 5 feet (1.5 m) wide after 10 years in the form of a perfect dense pyramid, suggesting a rate of growth exceeding 12 inches (30 cm) per year. This is a top choice for large landscapes and arboreta where it can be allowed to grow to its magnificent potential. This cultivar originated as a seedling selected in 1929 by the Arboretum National des Barres, Nogent-sur-Vernisson, France. 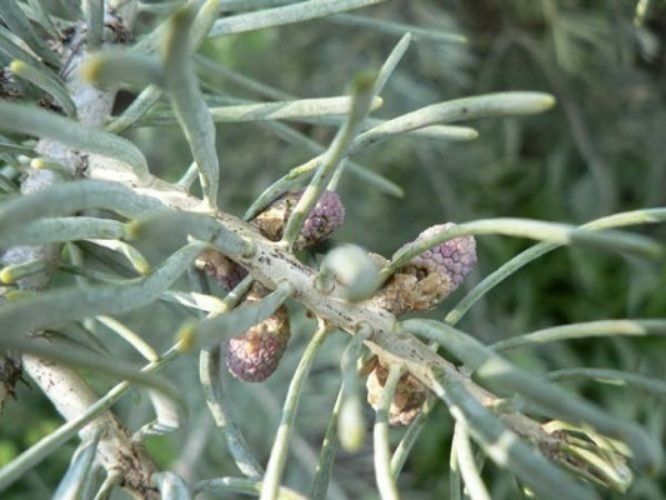 Despite being an old, well-established plant it remains rare, despite being in the North American nursery trade since before or around 1965. Similar seedlings are said to have occurred from time to time. In the Latin language "candicans" translates into "white or hoary." Attribution from: North American Landscape Trees; Jacobson, Arthur Lee. ©1996; Ten Speed Press. 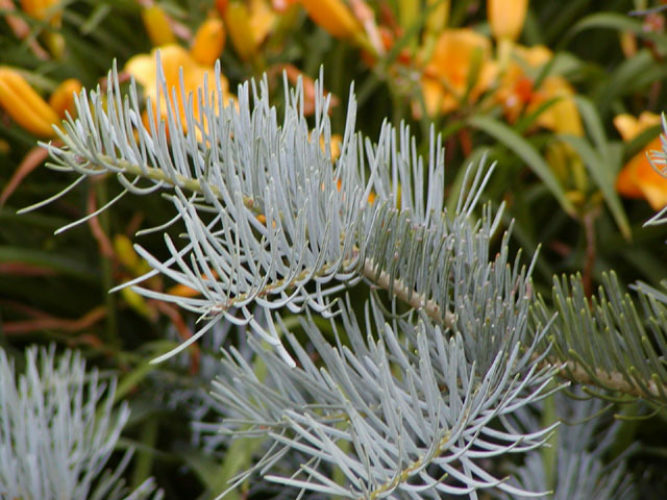 Abies concolor 'Candicans' — foliage detail, an example of the brilliant blue color of the cultivar. 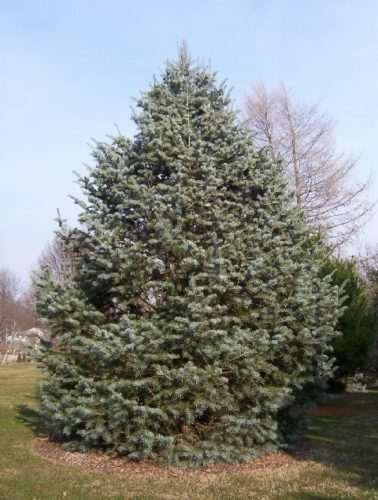 Abies concolor 'Candicans' — a 7 year old plant about 5 feet tall. 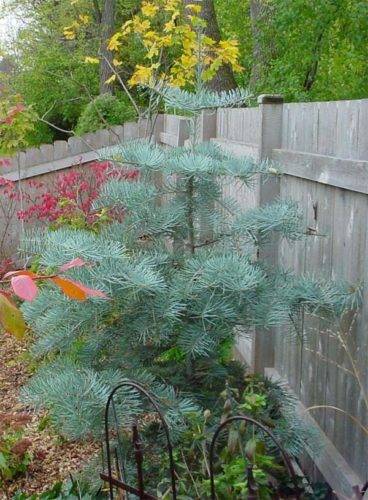 Looks great with fall colors in the garden with it's blue color and open habit. Abies concolor 'Candicans' — at Bickelhaupt Arboretum, Clinton, Iowa in their Heartland Collection of Garden Conifers, March, 2004. Abies concolor 'Candicans' — a closeup of foliage detail. Abies concolor 'Candicans' — a specimen ACS Reference Garden at The Oregon Garden, Silverton, during the 2011 ACS National Meeting. Abies concolor `Candicans' — note sparse waxy needles and small inflorescences. 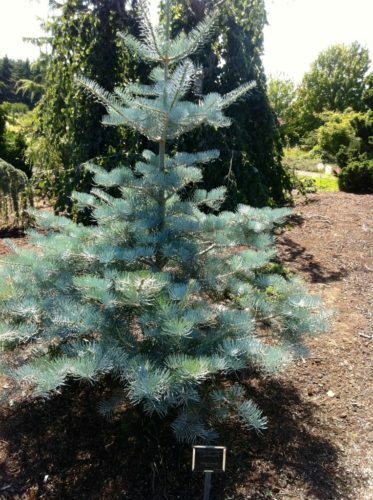 Abies concolor 'Candicans' — a magnificent specimen at Bickelhaupt Arboretum, Clinton, Ohio.